Last week, We visited the Four Mile Historic Park in Denver where we delved into Denver’s early history and took a tour of the original house and the grounds. While Mike and the rest of the group were able to actually glean information from the tour, I mostly just watched Maxon disturb pioneer-era artifacts and throw choking-hazard marbles from the hands-on toy basket exhibit at the authentic cast-iron stove. We also got to enjoy some treats from the working summer kitchen, watch a blacksmith at work (on what, no idea), and visit the stables of horses and goats. It took Maxon a while to sort out that the huge living creature was supposed to be the same as his Little People pet horse and of EIEIO fame but oscillated between wanting a closer look (“animal… eating!”) and hiding behind my legs. The goats did not get the same amount of interest but he did wander the yard looking for “animal…more animal”. 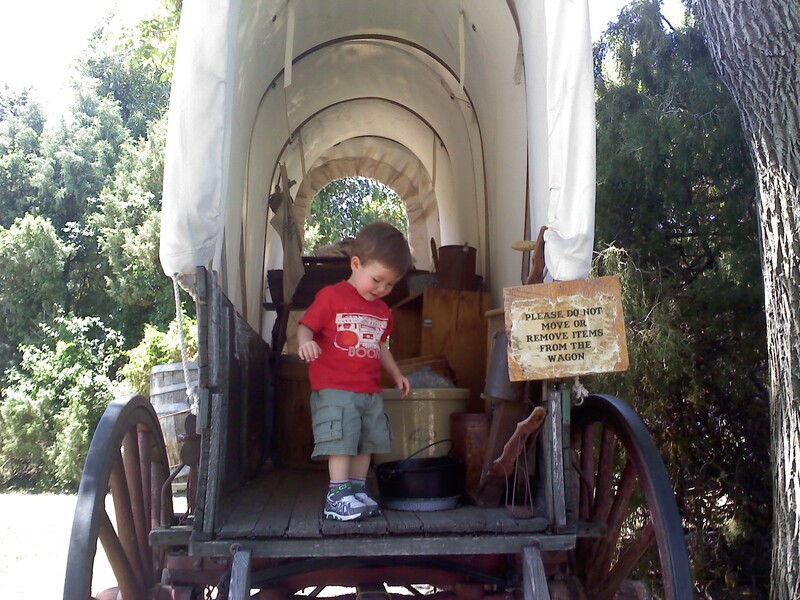 He even got to run around inside a teepee (perfect pronounciation there…might have to do the heavy use of the word “peepee” in our house). Maxon’s speaking skills grow in leaps and bounds by the day, yet at the same time, it’s getting harder to understand him. It was simple enough to decode “two Mommy two Daddy” when Mike and I would both show up to get him in the morning but he apparently has gotten wise to the fact that everyone else seems to speak in these long sentences and so he fills in the spaces with lots of gibberish and then finally ending with the relevant word. Such as “gablgablgabl lublublub ta fall” which is loosely translated as “I’m going to make myself fall [down on purpose]” or “two Mommy two Daddy” turning into “two mum-daddy dad-mommy”. He is also able to associate separate items as being related, such as pointing out one of our bikes “by-thi-ckle” and then saying “helmet”. This morning I told Maxon that Daddy was out on his bicycle and after lunch, when he asked where Daddy is, I said that he went “bye bye” and he responded with “by-thi-ckle”. We’ve only recently successfully distinguished trucks from buses but now most car noise is pointed out as a motorcyle but he insists on calling it a bicycle. In some instances, it might also be a “by-thi-truck”. We’re also working on differentiating between airplanes (“ayteepee”) and helicopter. Not sure where “ayteepee” came from but it might be from combining airplane and helicopter. I don’t think he actually considers the two related, but our friend Mark was renamed “ani-Mark”. He does love looking for animals in all shapes and forms. Only mother can fully understand and interpret any word his son is trying to say. Kudos for you!!! Love all Maxon’s new words! wow! Does he look like his cousin zach!